Consists of 3 coaches Set 205 - Bke 3rd 3718 (With Working Light), Corr 1st 7229 and Corr 3rd 1123 . Consists of 3 coaches Set 248 - Bke 3rd 2781(With Working Light) , Corr 1st 1199 and 3rd Open 1445 . 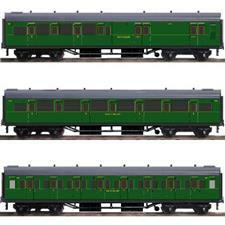 Ace Trains O Gauge C/23 CC, SR Maunsell Malachite green post-war coach, Corr Composite Coach 7216. Single Coach. 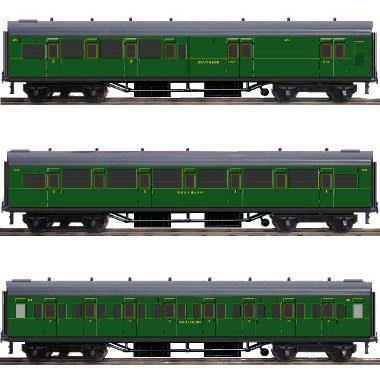 Ace Trains O Gauge C/23D SR Maunsell malachite green post-war coach, Dining car No. 7869. Single Coach.